A key-value database is a type of nonrelational database that uses a simple key-value method to store data. 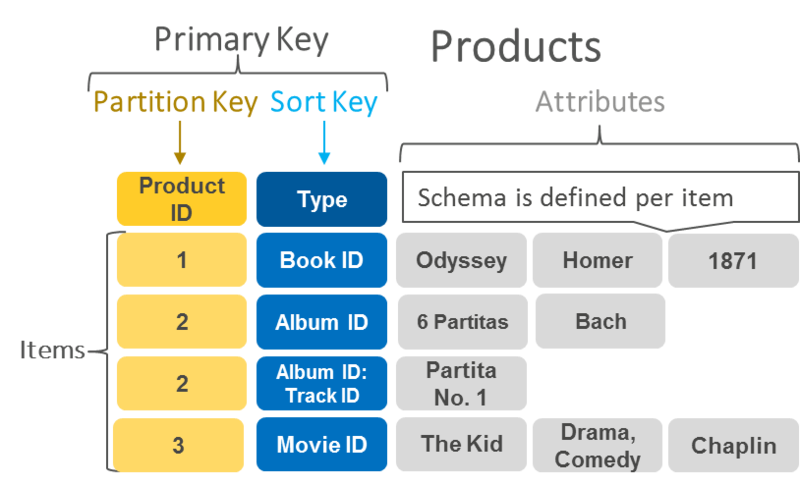 A key-value database stores data as a collection of key-value pairs in which a key serves as a unique identifier. Both keys and values can be anything, ranging from simple objects to complex compound objects. Key-value databases are highly partitionable and allow horizontal scaling at scales that other types of databases cannot achieve. For example, Amazon DynamoDB allocates additional partitions to a table if an existing partition fills to capacity and more storage space is required. The following diagram shows an example of data stored as key-value pairs in DynamoDB. A session-oriented application such as a web application starts a session when a user logs in and is active until the user logs out or the session times out. During this period, the application stores all session-related data either in the main memory or in a database. Session data may include user profile information, messages, personalized data and themes, recommendations, targeted promotions, and discounts. Each user session has a unique identifier. Session data is never queried by anything other than a primary key, so a fast key-value store is a better fit for session data. In general, key-value databases may provide smaller per-page overhead than relational databases. During the holiday shopping season, an e-commerce website may receive billions of orders in seconds. Key-value databases can handle the scaling of large amounts of data and extremely high volumes of state changes while servicing millions of simultaneous users through distributed processing and storage. Key-value databases also have built-in redundancy, which can handle the loss of storage nodes. Amazon DynamoDB is a nonrelational database that delivers reliable performance at any scale. It's a fully managed, multi-region, multi-master database that provides consistent single-digit millisecond latency, and offers built-in security, backup and restore, and in-memory caching. In DynamoDB, an Item is composed of a primary or composite key and a flexible number of attributes. There is no explicit limitation on the number of attributes associated with an individual item, but the aggregate size of an item, including all the attribute names and attribute values, cannot exceed 400 KB. A table is a collection of data items, just as a table in a relational database is a collection of rows. Each table can have an infinite number of data items. You can be up and running with DynamoDB in 10 minutes with this step-by-step tutorial. Learn more about DynamoDB and get started today. Apache Cassandra is a commonly used, high-performance nonrelational database. AWS customers who currently maintain Cassandra on-premises may want to take advantage of the scalability, reliability, security, and economic benefits of running Cassandra on Amazon EC2. EC2 and Amazon Elastic Block Store (Amazon EBS) provide secure, resizable compute capacity and storage in the AWS Cloud. When combined, you can deploy Cassandra and scale capacity according to your requirements. Given the number of possible deployment topologies, it’s not always trivial to select the most appropriate strategy suitable for your use case. Use Best Practices for Running Apache Cassandra on Amazon EC2 to deploy Apache Cassandra in the AWS Cloud. DataStax Enterprise (DSE) is the always-on data platform for cloud applications powered by Apache Cassandra. DSE is designed to handle big data workloads across multiple nodes with no single point of failure. DSE addresses the problem of failures by employing a peer-to-peer distributed system across homogeneous nodes where data is distributed among all nodes in the cluster. DSE offers advanced functionality designed to accelerate your ability to create intelligent and compelling cloud applications. Integrated within each node of DSE are powerful indexing, search, analytics, and graph functionalities that are provided by combining Cassandra with Apache Solr, Apache Spark, and DSE Graph. You can write data once and access it using a variety of workloads or access patterns, all from a single cohesive solution. Use the AWS DataStax Enterprise Quick Start (also available in PDF format) to deploy a DSE cluster in the AWS Cloud.